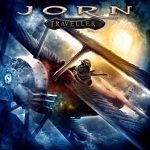 Frontiers Records is pleased to announce the release of a brand new – all original – studio album JORN "Traveller" on June 11th in North America and June 14th in Europe. Considered one of the greatest legends in rock, and by many as the best male rock singer of the millennium, Jorn Lande never seems to stop producing music, and is back with yet another slab of classic 1st division heavy rock. The brand new album "Traveller" is definitely a suitable title to fit this gifted and creative viking’s extreme productivity. During his almost 30 year long career his albums have sold millions. He managed to release close to 40 albums with various bands/projects in the past decades, and "Traveller" is his 8th studio album under the Jorn banner. Some say he has passed his successors by his gift of being versatile, and ability to not get stuck in the political frames of the music business. A true independent "freebird" hammering his legacy in stone as he goes, with a band of grounded and solid craftsmen to back up his hurricane force voice. This album represents the first product of the pairing of Jorn Lande and the new JORN guitarist Trond Holter (Wig Wam, Dream Police). The result is eleven new songs encompassing a variety of moods and styles, with Lande’s voice shining through memorable anthems, backed by wonderful grooves and tightly-executed Classic and Melodic Heavy Metal. “This album has all the elements of the Jorn legacy,” says Lande. “It is heavy, but still very melodic and experimental, and it really rocks! As usual we haven't spent much time analyzing the material before recording it, this is an album about life, doom and death reflecting on what I know and thoughts about what I don't”. Being one of the most productive artists of his time, Jorn makes sure that the fans won't have to wait long for the rock!